This Catskill Craftsmen kitchen cart features a simple, classic design in a natural finish, making it suitable for both traditional and contemporary kitchen décors. It provides storage space in a double-door cabinet and in an easy-glide utensil drawer, plus valuable work space on a genuine butcher block top. Only 25-1/8 inches wide and 17 inches deep, it takes up little floor space, but delivers lots of utility, making it an extraordinary value. 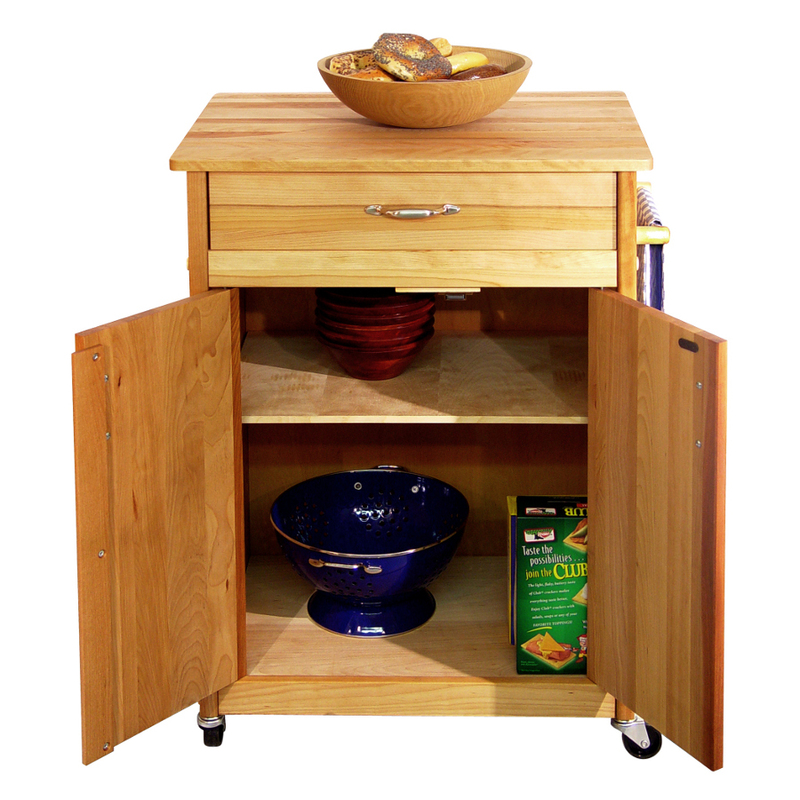 You’ll love the additional storage space this beautiful hardwood kitchen cart will supply. Its sliding drawer – 16-1/2 inches wide, 12-1/4 inches long and 4 inches deep - is a great place to store the utensils you reach for over and over again, such as serving spoons and knives. The flat-panel doors beneath the drawer hide a storage cabinet that measures 20-1/2 inches wide by 14 inches deep and 22-1/4 inches high. That’s more than enough space for small appliances, cookware, mixing bowls and other kitchen items you’d prefer to keep out of sight. The hardwood butcher block top on this Catskill rolling island allows you to prepare meals without using up precious built-in counter space. Goodness knows, no chef, professional or otherwise, can ever have too much counter space. 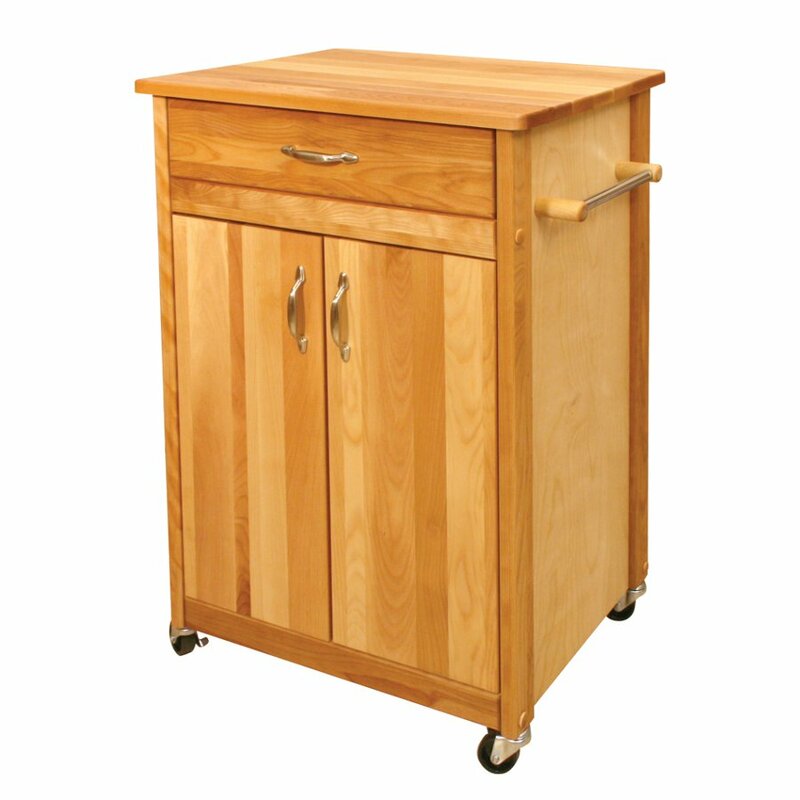 The butcher’s board on this cart comes finished with a food safe oil that helps protect the wood. In order to keep if safe and looking great, you’ll want to re-oil the wood from time to time so you can continue to cut, slice, dice and chop on it with confidence for many years to come. Consider adding Catskill's Original Butcher Block Oil to your cart.